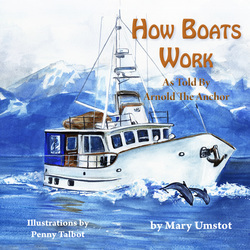 Arnold does a great job to help kids learn how a boat works from bow to stern. The story by Mary Umstot is catchy; the illustrations by Penny Talbot are outstanding as you can see. Mary and Penny had a great time giving birth to this book!